The Craftable Diamonds Mod is a mod that has a promising idea but does fail to deliver in some aspects. Although the simple thought process behind the mod was good, it simply makes the game to easy. Crafting diamonds out of four iron ingots is far to simple, however the mod could be improved by increasing the difficulty of the recipe. As of now, the mod is available for the latest patch of Minecraft 1.8 and Minecraft 1.7.10 and is compatible with Forge also. To use the Craftable Diamonds Mod you first of all need to download and install this mod with Forge. Then, once you open up your game all of the mod’s features should have already been automatically updated. The mod is currently available with Minecraft 1.8, so therefore should install very easily. There is currently no public video showcase showing the features of the Craftable Diamonds Mod. 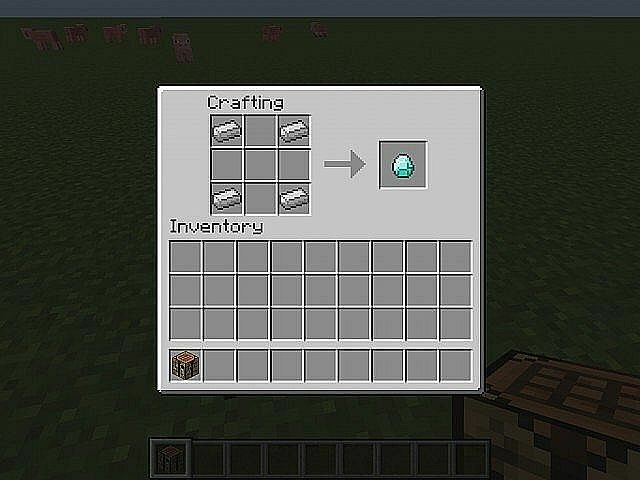 The Craftable Diamonds Mod allows for a way to craft diamonds in survival mode. Simply just four iron ingots in the top left, top right, bottom left and bottom right hand corners of your crafting table in order to craft one diamond. Compatible with Forge, MCPATCHER, OptiFine and more! Next, download the Craftable Diamonds Mod and drag and drop the .zip files into the ‘resoucepacks’ folder. There are currently no public changelogs for the Craftable Diamonds Mod. The developer released all of the features for the mod upon initial release so I can’t really see him updating the mod any further. The mod is so small that there is nothing left to add.